I can make some very compelling arguments that these massive tefilin BT's influx, did un repairable damage to the core of Lubavitch, is it worth it? some say the score is in and.. It could well be that the criteria of "who is a Jew" as well what Jewishness constitutes, what the meaning if Jew is, was different than yours. הרהור תשובה? from this drivel? pheh? guess success is defined in various ways. nauseating. "How DO we judge success?" The caterpillar became a butterfly and I like that, but the pickle became a cucumber and I don't like that (except in the falafel sandwich), so how do we measure success? what are we measuring! does size matter? do all pizzas taste the same? would you not comment on rav kook because he is not alive??? eMail blood bleed, Did Schwartzie became more Zionist or less, since his "redemption" . Dear concerned I would think that Lubavitch of today has much larger issues plaguing them these days than what SR said or thought on this or any other Lubavitch campaigns of yesteryear, your ship sailed off far away passed the "dire straits" and no one pays attention anymore it seems, to your echoed cry for help, just don't give up. is he than commenting on SR because he "is" alive? in spirit at least, that's noticeable . How to judge success? The $159.99 dollar question, at Amazon you can get a pair of tefilin for 159.99 a shofar for 15. and a pop-up sukkoh for 59. to some that's success, to some a blat of Talmudic gyration instead of yoga, go figure. I can make some very compelling arguments that these massive tefilin BT's influx, did un repairable damage to the core of Lubavitch, is it worth it? some say the score is in and.."
I'll rest rest my case with you. too old for this Jew'ish pop maven. I can make some very compelling arguments that these massive tefilin BT's influx, did un repairable damage to the core of Lubavitch, is it worth it? It was just reported that there are 17,000 OTD (with tefilin) in Israel, 1,300 each year! and you talking about the success of Mivtza what!? em: "that they were educating their children in religious schools, not under the heretics" !!! Unfortunately this is the truth, since Lubavitch changed course of their stringent anti-zionist to political-zionisim and nationalism which became apparent after the six day war, there Miftza propaganda took off too, let them try proclaiming their core anti Zionism as their last 3 rebbe's stated in abandoned, their tefilin BT's which is coupled with "Nationalism" will crumble. PS: since the American liberal Jews started to be "less" supportive of Israel more of them assimilated deeper into the culture, and since Lubavitch became "more" supportive of Israel more "liberals" jews come to them, Nationalism is the "bond" that holds the un Orthodox Jews togheter, American liberal Jews shying away from Israeli natiolisim so they loose the bond, Lubavitch (and other's) offer Israeli nationalism! and they attract. Satmar rebbe is right,the Lubavitcher rebbe said he did all he could to bring moshiach now its up to the chasidim ,the chasidim didn't bring moshiach yet they claim we didn't do enough like tzedaka or teffilin,but they don't say bec of negative sins first sor maira then asei tov. "wedding of JJ Hecht of Crown Heights and Hadassah Halpernof Toronto brought an unusual sight to NY's famed Times Square: a traditional Chuppah." Lenin said: "The Capitalists will sell us the rope with which we will hang them". Witness China and Russia of today. China sell us "our money" and our "knowledge". and we sold the Russians the "rope-a-dope" Trump regime. We conquered Communism without a "shot". are they conquering us now without a shot? Would the Shinover Rebbe be mesader kedushin ? JJ Hect's grand father reb Tzvi Elimelech was sent from Galicia by the Shinover Rebbe to America to be a meshulach, a fundraiser. He became the manager of the local mikvah on Prospect Place in Brownsville, where he met the Freirdiker Rebbe. the rest is history. sinning is in the eyes of the beholder. "There was a moment during the chupah where I looked up and I saw a black girl, who must have been around 15 years old, taking a picture of a Chasidic wedding as people were swaying to the Alter Rebbe’s nigun,” said Rabbi Hecht. Why would something not be measured by its effect? If Kiruv were a mitzva in the Torah, we would not care whether it was effective. But Kiruv is not a Mitzva on its own, it is merely a part of a Mitzva which is being מרבה כבוד שמים, which is only done if it is effective. I don't know if the מבצע התפילין was effective or not, but I have long wondered whether the Chabad Kiruv is efficient enough. With so much work being invested, perhaps they could use more seichel and targeted Kiruv. When a Shaliach manages to do major Chanuka parties and hamentash tastings, with shofar blowings during Elul etc., none of which have intrinsic value, their success can only be measured by how many people actually keep mitzvos due to these mivtzoim. If a huge Chanuka party was celebrated with 150 attendees, and two of them return for a Shiur in Judaism, the success is not the 150 attendees, rather the two that returned. With that mindset, what is Chabad's success rate and could it be done better? Is this a thesis or a dissertation? or just a cat in a bag kicking around. "PS: since the American liberal Jews started to be "less" supportive of Israel more of them assimilated deeper into the culture, and since Lubavitch became "more" supportive of Israel more "liberals" jews come to them, Nationalism is the "bond" that holds the un Orthodox Jews togheter, American liberal Jews shying away from Israeli natiolisim so they loose the bond, Lubavitch (and other's) offer Israeli nationalism! and they attract"
Please mail a SAE with a five dollar contribution for the full version of my antithesis on this topic, mean time read the short cryptic version of it and try to figure out the heads and tails of it, if you can't than the message weren't meant for you, that's why it's in written in cryptic. Liberia's = frei yiden, those who became alienated from "Israel's Nationalism" wich was their bond to "Yiddishkeit" many of those are becoming more assimilated and shy away from Judaism completely. (because "their" liberal institutions don't support Israel's nationalism anymore). But some of those which do want still their meager Yiddishkeit they turn to chabad wich still offers both some Yiddishkeit with buckets of Tar in the form of Zionist Nationalism. unlike the majority of the "American Jewish liberal institutions" which are not enthusiastic about Israel anymore. By this arrangement Israel and Lubavitch support each other its a win win for both, which some say a match made in..
"אויף דעם האט זיך ר' איציקל ז"ל אנגערופן: "איך קאן דעם סאטמאר רב, ער מאכט נישט קיין טעות!. ע"כ המעשה מפי השמועה"
" But Kiruv is not a Mitzva on its own, "
"But Kiruv is not a Mitzva on its own,"
"If a huge Chanuka party was celebrated with 150 attendees"
"none of which have intrinsic value,"
What the writer quotes from על הגאולה is kind of similar to RASHAB'S attitude to the התעוררות of some assimilated jews to wear תפילין at the beggining of zionism. He writes that since it doesn't come from a good mekor so the התעוררות won't last etc. see the introduction to קונטרס ומעין. B: "liberals do come or dont come"
May 16th. UM student Elizabeth Goldenberg dies after graduation. In a recent profile on the university’s College of Arts & Sciences website, she expressed her love for her involvement in "Emet Israel" and "UChabad", a Jewish student organization at UM. look in your bathroom mirror precisely 3am he will be waiting for you. H: "We did not hear that -- they were educating their children in religious schools, not under the heretics"
you're infringing into the domain of the pester rebbe shlita in name and theology. Sorry, after looking up in קונטרס ומעין I realized that what I wrote in the previous comment about RASHAB was a mistake. I was writing from memory and he writes something totally different, but I think that my first point is still right ונפלה היסוד נפלה הבנין, but who cares anyway. אבי you could write something negative about satmerer ruv. rosh: "u have an idea the tanug of the shechina"
No i don't please elaborate. R Ahron and R Zalman Leib Issue Joint Proclamation Regarding the Giyus! satmar vs lubavitch? It's a different ball game! LR: had a masters degree..
SR: Could not write or speak any foreign languages, he didn't know how to write or read the A-B-C .
"The satmarer Ruv is not talking about the success of מבצע תפילין, but rather of the influence of the "miracles" in getting people to do תשובה, stopping to eat נבילות וטריפות etc. (if you'll just read what he writes)"
You're imposing your own moderate views into the fanatical words of the SR. The SR ignored the traditional understanding of כתובות קיא when he wrote ויאול משה. There's not a single major commentator who actually writes what the SR claims. His unique extreme chiddush is based on conflations, speculations and half-quotes. In על הגאולה he goes further, engaging in conspiracy theory, מוציא שם רע and a bizarre negation of akk rabbonim, whether anti-Zionist or not, who would believe that there miracles in '67. You may be anti-Zionist yourself, but I doubt you're a hater like the SR. Otherwise you would affirm his opinions rather than deny them. "he didn't know how to write or read the A-B-C ."
A chanuka party is not Torah, sorey to inform you. How many actually learnt Torah is the question, not hpw many allowed the shaliach to bless their cat. "A chanuka party is not Torah"
" How many actually learnt Torah is the question,"
"not hpw many allowed the shaliach to bless their cat." "hamentash tasting ceremonies are not. Success is measured by the shiur, not the hamentashen"
This buda is starting to make some sense here, I'm off to Tibet adios. That's called real Kiruv! No Israeli Diaspora programs, No blat gemorah, No money, Just pure l'esham shumayim! Around that time the Freirdiker Rebbe was informed that there is a governmental law sanctioning release time for Jewish children from public schools to study their faith. The Freirdiker Rebbe called upon the Rebbe and Rabbi Hodakov to implement this. A program started under the organizational name Shalah, a Hebrew word with the acronym, Shiurei Limudei HaDas, classes for religious training. In 1945, he was appointed the official director of the National Committee for the Furtherance of Jewish Education, NCFJ organization. Rabbi Hecht expanded the Shalah program to incorporate many other programs including anti- missionary work and "Lag B'Omer parades". Rebbetzin Hecht worked for Release Time even before she met Rabbi Hecht. She recalls running a group in Rabbi Nissan Telushkin’s shul in East New York. On an average Wednesday afternoon she "took out 200 girls from public school" to attend the release time program! There were simultaneous programs for boys as well. Thousands of Jewish children were touched in a most Jewish way. The question is, if that same effort would have been placed into making a Yeshiva where 20 bochurim would have learnt all day, is that a smaller benefit? Do we measure success by the amount of minutes learnt? Because if so, 20 all day and 200 a couple of hours a week should balance on the side of the 20 all day. I cannot give the answer, just that the question should be asked. Unfortunately, it has become an axiom that Lubavitch does Kiruv, so whatever Lubavitch does is the benchmark of Kiruv. Perhaps the same amount of benefit could be reached with a different approach. The bochur who spends a day putting tefillin on tourists, could spend a day learning with someone Torah. Which is better? How do we measure? you must mean siget-satmar if true. there is a "signature" on some gov document he signed "Joel teitelbaum" some one asked him once on it, he said his mother teached him how to do it because he might have to do it once. but he signed it as "scrolled art" not as spelled letters, so I heard. LFB: "could spend a day learning with someone Torah." for-free! "One of the dirty little secrets of Der Alter Heim was the fact that most kids in Poland, Hungary and Rumania went to Public School." someone must of tell him that the NYT is anti-zionist so he read every line of it that fits to print, I'm sure. The list of issues as desecration cemeteries or mixed swimming, that was attached, were just a cover up ploy that normative Jews should not brush them off as Neturai Karta. also as big as his camp of followers was, he still was desperate that other rabonim should be on the dais, like the old Tzelemer rav and his nephew the rav of Pupa who were not on satmar payroll. Did he check the polls if it had a effect? Only tefilin on a Jew has to be known the facts and the effect? Did he check all the gentiles in Manhattan that heard his so called torah, if there body is clean of soil? 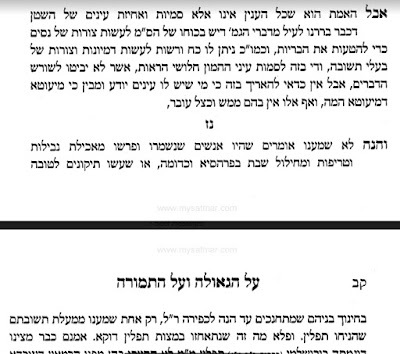 "since it doesn't come from a good mekor so the התעוררות won't last etc"
you didn't have to attribute it to the RSHAB every chasidish sefer will tell you the same in almost every chapter, it gets even worst than that, each mitzvah they do is in fact a sin! see forward on sefer "derech pikidacu" from the bnei yisuscor, so whatever fell fell its roadkill, But the "foundation" of what said is as strong as ever. lezer r u going public now with your smear campaign of the SR ? Was this part of your commencement speech, where you suppose to thank your parents (for paying tuition on time), and the schools faculty (for not trowing you out in middle of a semester) just curious? Ephraim: "The SR ignored the traditional understanding of כתובות קיא when he wrote ויאול משה. " Ephraim: "There's not a single major commentator who actually writes what the SR claims." ! וזלש"ק של מרן הגה"ק מקאמארנע זצלה"ה זי"ע, נפטר י' אייר תרל"ד. בספרו אוצר החיים פי' לתרי"ג מצות, נדפס בהיכל הברכה, ובספרו הק' נתיב מצותיך. וזהו אף שהיא מצוה גמורה לא יבוא במנין באין פנים שלא יבוא למנין שום מצוה אלא מה שיש כח ביד אנושי לקיים, אבל מצוה שצריך עזר א' ונבואה לא יבוא למנין ולא מצינו מצוה שיהיה אדם נביא או בעל רוח הקודש אף שהנבואה שורש גדול בדת ישראל והיאך יצוה לנו האל ב"ה מצוה שאין בידינו לקיים אותה אם לא בעזר א' ובאותת ובמופתים כנראה ממלחמות יהושע שהיה כמה אותת ומופתים בשמים ובארץ וכן בכל המלחמות. ומצוה כזאת לא יבוא למנין באין פנים ואסור לנו לעשות שום מלחמה וכיבוש אם לא עפ"י הנביא ומצוה התלויים בנבואה לא יבוא למנין אלא שכל פסוקים האלה הם לשעתן לזמן יהושע שהנביא צוה להם עפ"י השם ב"ה שילכו למלחמה ויכבשו את הארץ והבטיח אותם שיצליחו בכל מעשיהם וכל זה לזמן יהושע. Ephriam: "You're imposing your own moderate views into the fanatical words of the SR"
You're taking your opinion of the SR z"l from the liberal Jewish media who tried to silence him since his birth to his dead and afterward, I'M NOT. SR RAV Z"L WAS A "MODERATE ON MOST OF HIS HALACHIC OPINIONS, CERTAINLY NOT "FANATICAL" not even on Zionism, hence the NK activities and others.. yes he was strongly convicted on his opinions that's not fanatical that's Leadership and he expressed his opinion's strongly and forcefully as a Leader! 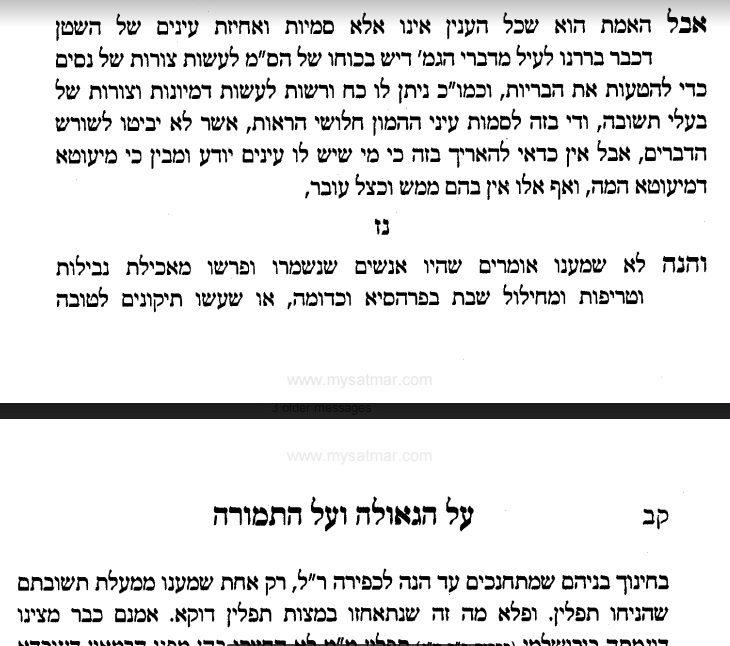 Alter: "all conclude that you should do all mitzvhas"
And you should "specify" first to whom your mitzvah is directed! if not "delivered" as addressed Please return to sender! "but I doubt you're a hater like the SR"
Dumb is what dumb says. I sure don't doubt that you're an ignoramus dumbbell, The SR from his birth to dead, gave his time, his wisdom, and life only for others, he was the master fund raiser for "tzadaka" that ever was, only for "others". he lived and existed only from his ahavat yisruel !!! . Bee: "For a pragmatic Letz like you and your ilk"
YES, LETS TALK ABIUT LIETZUNAS ! sarcasm is hidden anger, comedy is a coping mechanism. B Talmud: "if someone has a slight feeling of shechinta beguloso". Sell that to the Eskimo's! "We did not hear that there were some people abstaining from eating treife food"
One person who stands out as a direct result of the Lubavitch'er מבצע "Release Time" is Rabbi Sender, Kashrus Administrator of the Chof K organization. There is nothing wrong with Lubavitch, that can't be cured with what is right in Lubavitch, I hope. "eMail blood bleed, Did Schwartzie became more Zionist or less, since his "redemption" ." When Rabbi Yossie Shemtov turned 60, community members didn’t give him a tie or a gift certificate. Instead, nearly 60 men surprised him on his Hebrew birthday, each one wearing tefillin. It turns out that many could. In addition to serving as executive director of Chabad of Tucson, Ariz., Shemtov is also senior rabbi of Young Israel of Tucson, where the surprise took place. As person after person trickled into the sanctuary for 6:30 a.m. prayers, it dawned on the rabbi that something was afoot. Even as services were underway, the rabbi and his son-in-law, associate rabbi Yehuda Ceitlin, were busy helping men into tefillin and tallit. While about 50 men showed up that morning, another 10 put on tefillin later that day at visits with Shemtov. The birthday surprise comes as Jewish communities worldwide mark 50 years since the Lubavitcher Rebbe—Rabbi Menachem M. Schneerson of righteous memory—launched the Tefillin Campaign just prior to the outbreak of the Six-Day War. To keep the momentum going, Shemtov has announced the establishment of the Chabad of Tucson Tefillin Fund. 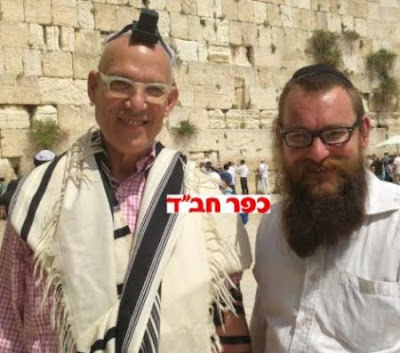 “The goal is to subsidize a pair of authentic tefillin for Jewish men committed to putting them on regularly,” he said. Chabad will cover part of each pair of tefillin for those who make the commitment. did the 60 have a guf nuki???? Ironic. You guys take a hyoer-literal view, brick by brick, like an engenier, vedal. no "איכות" in the Navy yard, והבן כי קצרתי.